Search Results for "mens accessories"
Men's accessories. Shoes, watch, belt, toilet water. Evening training camp. Men's Accessories. Shoes, Perfume, Smartphone, Belt, Purse and Pen Are Moving on a Black Background. Stop Motion Animation. Top View. 4K. 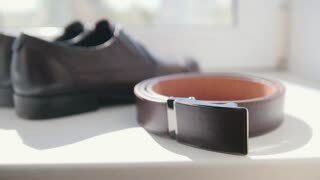 Men's accessories, butterfly shoes cufflinks and belt. Men's accessories lie on the wooden surface. Evening training camp. set wedding groom, men's accessories for wedding.